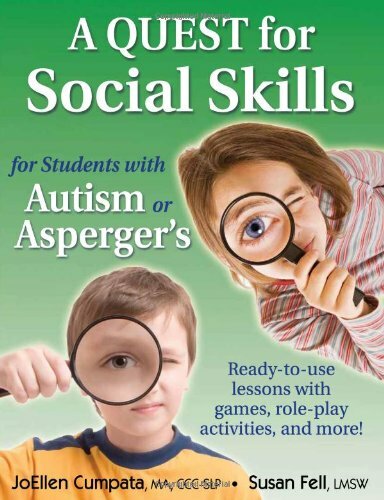 Item Nr: KM 12166 Title: QUEST for Social Skills for Students with Autism or Asperger's: Ready-to-use lessons with games, role-play activities, and more! Book provides lessons and activities to increase the social skills in children that have been diagnosed with Autism or Asperger's syndrome, covering greetings, daily hygiene, managing stress, starting conversations, resisting peer pressure, dating, Internet safety, and more. QUEST (Questioning, Understanding, and Exploring Social Skills and Pragmatic Language Together) is a social skills program created to help middle school students with ASD. Includes a CD with printable worksheets and visual aids.